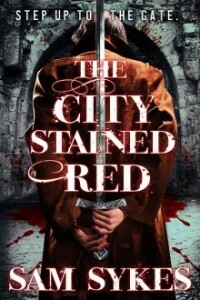 Congratulations to Sam Sykes, whose newest novel, THE CITY STAINED RED, is out today (October 28, 2014) in Ebook! (The print version follows in February, 2015, according to the publisher, Orbit/Gollancz.) Sykes’s books are described most often as “epic fantasy”—which apparently means that they’re composed of serpentine plots executed by entertaining characters, and the humor is as high as the body count. While the setting is definitely of Another Place and Time, the people—and other things—you’ll meet there are so real that you’d like to hang out with them, if it wasn’t so dangerous to be in their vicinity. Lenk pulled himself out of line and began to walk past people toward the gate. Head down, eyes forward, wearing a face he hoped looked at least a little intimidating. The only way this was going to work was if this no-necked guard believed Lenk was mean enough to not be worth stopping. _Of course_, he sighed inwardly. Lenk’s hand was up before either of them knew it, slapping the captain’s hand away. The guardsman blinked. Once. Slowly. The captain looked him over with a glare that Lenk recognized. Usually, he saw it only a moment before swords were drawn. But the captain’s stare was slow, methodical. He was sizing Lenk up, wondering just how much trouble this was going to be worth. Lenk decided to give him a hint. He slid into a tense stance, making sure to roll his shoulders enough to send the mail under his shirt clinking and show just how easily he wore the sword on his back. He leaned down to the young man and forced the next words through his teeth. The young man didn’t flinch. His eyes never wavered, not to the captain’s guards reaching for their swords, not to the captain’s gauntlets clenched into fists. That blue didn’t so much as blink as he looked the captain straight in the eye, smiled through a split lip, and spoke. Return to The Methadone List. This page was last updated on October 31, 2014 at 5:27 a.m. (PDT).